BAND-E-AMIR NATIONAL PARK, Afghanistan (CNN) -- Most days it is easy to think God may have forgotten about Afghanistan, but there can be a day when you feel like you are in heaven. 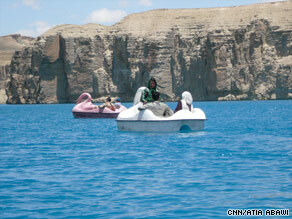 Efforts to make Band-e-Amir a national park began in the 1970s but were held up by decades of war. We were invited by the United States Agency for International Development to witness the dedication of Afghanistan's first national park: The Band-e-Amir National Park, a series of six crystal-blue lakes surrounded by heart-stopping cliffs and natural dams that capture the imagination. "'If you look at the beauty,' as we say in our language, 'it's poetry for your eyes, for your mind and for your soul,'" said the former Prince of Afghanistan, Mustafa Zahir, who attended the opening ceremony. As we flew from Kabul in a U.S. military Chinook helicopter -- a flight that took a little over an hour -- the journalists rolled cameras and snapped pictures as we passed the world-famous Buddha statues en route to the park. Now just crater cutouts in the towering cliffs of Bamiyan province, the statues were a hidden treasure for centuries. Many even called them a wonder of the world, with their perfectly-chiseled design and sparkling jewels encrusted throughout. But in March 2001, the then-ruling Taliban blasted the structures -- reducing them to rubble as they embarked on a mission to spread fundamentalist Islam. Even without the statues the site is still mesmerizing, a place I had only known from pictures. Although we hovered over for only a few minutes in the helicopter, I was struck by the beauty and transported to a site admired by many before me. I was not alone in the admiration; most of the passengers came over to one side of the Chinook to peer. Not too long after passing the incredible terrain, we were hit by an azure wonder -- another site I had only previously seen in photos. The lakes cover 59,000 hectares of rock and desert land. Surrounded by red limestone cliffs, the water comes from the ground and is so clean you can drink it. Efforts to make Band-e-Amir a national park began in the 1970s but were put on hold through the decades of war that ravaged the country. The U.S. and Afghan governments, along with the Wildlife Conservation Society, began working with local communities in 2006 to revive that vision. "The saddest day of my life was when the military coup took place and I had to leave. The happiest day of my life was when I came back to my country," said Mustafa Zahir, the former prince, who is now director of the National Environmental Protection Agency. "But this day is even happier than when I came back to my country because we have something tangible to show for the people of Afghanistan." Unfortunately, Band-e-Amir is still hard to reach for most Afghans, let alone foreigners who may want to venture out to the area. Today, it is a nine-hour drive from Kabul to Bamiyan --- and the ride is one over broken roads that passes through some dangerous provinces. "The people here are very peaceful and want reconstruction. But due to the lack of a well-balanced policy and planning by the Afghan government, nothing has been done in these areas," said Said Mohammad Ferozi, a school teacher. Ferozi also thinks that if the government will be using the people's land for the new national park, they should be compensated -- otherwise he sees it as an economic loss. "The government should reimburse the people for their land and properties (that they use) by giving them jobs in Band-e-Amir and land somewhere else in Bamiyan. So far, the government hasn't done anything tangible in this regard," he said. Other residents felt it was too soon to call the area a park. "The name is park, the government is happy to call it a park, but it's not a park yet," said Band-e-Amir resident Jaan Been. He used to come here as a child 30 years ago and remembers mountains full of trees and grazing deer. "If the government wants to help, have them plant trees," he said. "This is the perfect climate. Have the people plant it and there will be jobs for them. It will be green, the place will be a park!" Still, locals were happy that the world could once again see the beauty of their land. The serenity and the security of the Band-e-Amir National Park is a taste of Afghanistan's past and what it hopes will be its future. "You can come, feel free and enjoy the life. Enjoy staying here!" said Bamiyan's governor, Habiba Sarobi.